People call Amazon the Everything Store because you can buy just about anything there. But for Amazon sellers, it should be called the Nearly Everything Store because you can’t sell everything there, at least not without Amazon’s permission. Confused? Keep reading to understand Amazon’s gated Selling certain products and bran... More product categories. Before we talk about what categories you can’t sell in, let’s start with what you can sell. Many of the most popular product categories, like books, toys (except during the holidays), groceries and home & kitchen aren’t gated Selling certain products and bran... More at all. That means that any Amazon seller, from a college student selling a few books to a high-volume retail-arbitrage specialist can list and sell in most categories. However, there are a handful of categories that Amazon “gates.” In order to sell in these categories, you’ll need special permission from Amazon. 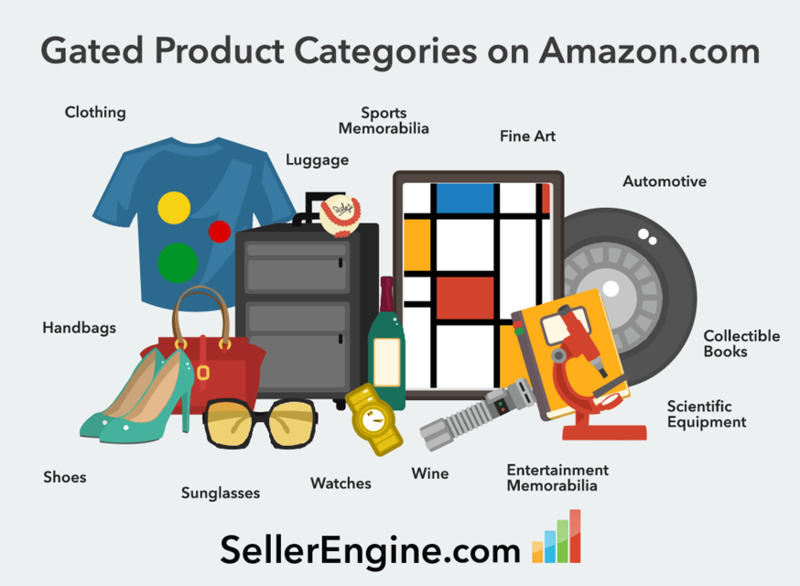 Here’s a graphic we made that shows the gated Selling certain products and bran... More categories that are of the most interest to Amazon sellers. These categories are gated Selling certain products and bran... More to protect both customers and sellers. Amazon wants their customers to have the best possible experience and wants sellers who specialize in these items to be protected from sellers who may not be as capable of providing a great customer experience. Read what Amazon has to say about gated categories. Each gated Selling certain products and bran... More category has its own requirements. For example if you want to sell clothing, you’ll need to apply and show that you have product images that meet Amazon’s standards. If you want to sell entertainment collectibles, you’ll need to authenticate your products with a third-party service like James Spence Authentication (JSA) or the Professional Sports Authenticator (PSA/DNA). Amazon’s decisions when it comes to who gets approved and who doesn’t can be baffling and maddening, at times. We’ve heard from sellers who had to apply 3 or 4 times before being approved to sell clothing, for example. Our best advice is to understand the requirements and if you’re rejected, ask for feedbackA performance rating on a scale of 1 to ... More. Depending on the category you might get some useful feedbackA performance rating on a scale of 1 to ... More that can help you improve your application. Kindly advice the properly solution for next scenario. As a Amazon seller, I want to start lauching a new products as a leather goods under my own brand. What I want to know, is the specified category which I should go for into and if it is gated or not. And if is gated, what should I do for approval, and how long it will take in order to launch before October? Thank you for your support. Thank you for your question! It really depends on the kind of leather products you want to sell. You might be able to sell leather goods in non-gated categories, as well as in gated categories, depending on the type of product. Feel free to shoot us an email at services@sellerengine.com so that we can talk more about your particular case and give you more specific advice.